Mount Rushmore is also known as the President’s mountain. It is located in the Black Hills of Keystone, South Dakota. President Calvin Coolidge officially dedicated the mountain on August 10, 1927 with a ceremonial drilling. This incredible sculpture has faces of four famous presidents: – George Washington, Thomas Jefferson, Abraham Lincoln and Theodore Roosevelt. This was built by the famous sculptor Gutzon Borglum. The work on this project started in 1927 and completed in 1941. This mountain was named after a New York attorney Charles E. Rushmore. The total cost of the project was one million dollars and it took about 14 years. On average three million visitors visit here every year. Dynamites, jack hammers, hand drills were used for carving the rock of Mount Rushmore. More than 450,000 tons of rock was removed overall to give it a perfect replication. At first, Borglum chose a mountain known as ‘Six Grandfathers’ for the sculpture to be carved. The height of every president’s face is approximately 60 feet long. A remarkable fact about this mountain is that no one died during the project considering the dangers. The eyes of every president are 11 feet wide, their mouths are 18 feet wide and noses are 20 feet long. About 400 workers worked to complete this memorial. Gutzon Borglum was 60 years old when he started carving this memorial and he died in March 1941 leaving the completion of this work to his son Lincoln Borglum. The actual plan was to carve entire bodies down to their waist but due to a lack of funds, the monument was declared completed in 1941. Every night, this monument gets illuminated for two hours. Declan, Tobin. " Fun Facts for Kids about Mount Rushmore ." Easy Science for Kids, Apr 2019. Web. 20 Apr 2019. 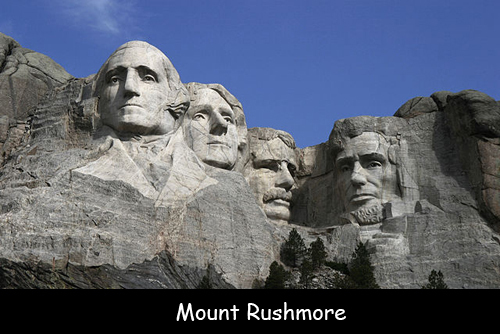 < https://easyscienceforkids.com/all-about-mount-rushmore/ >.